Have you ever wondered how to properly take some of your precious kicks along on a trip? Katha co-founders Mark Martinez and Steven Hung have both struggled with that very problem and decided there was a better way than shoeboxes and plastic bags. 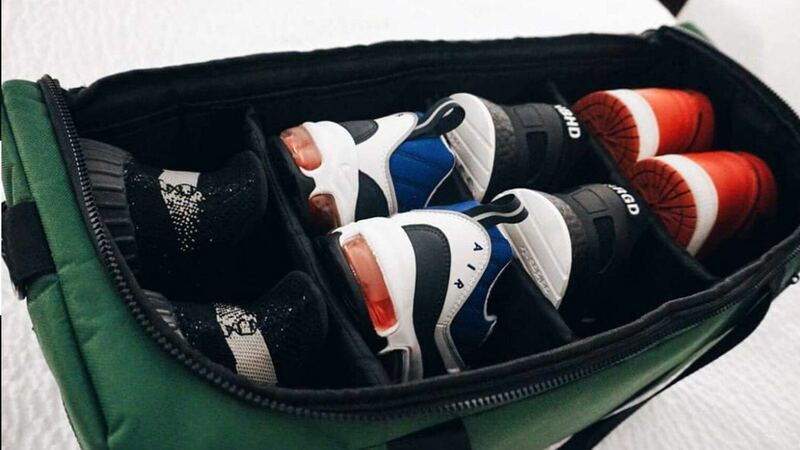 They came up with a waterproof dedicated sneaker carrier with pockets for your tech, which is also conveniently carry-on sized. Here, the makers also share exactly what shoes they would pack for a trip. Katha's first product is a duffle that works as a dedicated shoe bag. What was the inspiration for creating something so specific? 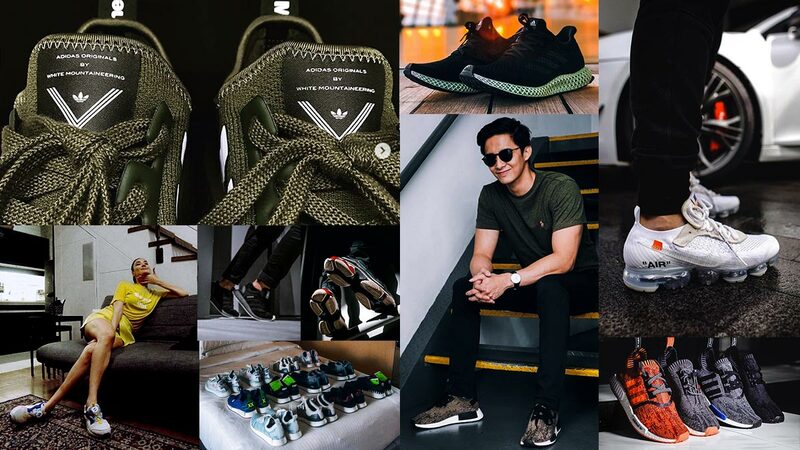 Wherever we go, we always like to bring multiple pairs of shoes or sneakers for different purposes, like flaunting our style, and it's a shame when you think about the wear and tear that sneakers go through when they're carried in a regular bag. We saw the need for this locally and in global streetwear—it’s always a much better feeling when you know your sneakers are being carried neatly and safely. The dividers are removable because you don't need to lug four pairs of sneakers around all the time either, which is why we always say the Katha duffle fits whatever your lifestyle requires. Is the duffle a locally produced product? The first run came from China but we have a local supplier now, and our next release is being made locally. Having a local supplier gives us a lot more freedom to be as creative as we want. Have you been able to reach the global streetwear market with it? Yes, actually we've been getting international inquiries ever since our debut and we've had customers from the US, Japan, Singapore, Italy, and London. We try our best to make sure it reaches everyone who wants one! The bag could have been a lot more expensive considering the value of the shoes it's made to carry. Instead, it's just P2,995—what’s the business rationale behind this? We wanted to make our first entry into the market accessible to people. We have higher-end releases planned with better materials as well as limited edition collections coming soon, though. And what four pairs would you guys personally carry in your bags? Off-white Airmax 97, Sean Wotherspoon Airmax 1/97, Vapormax Triple Black, Common Projects Achilles Low White. Yeezy Boost 350 Blue Tints, Undefeated Airmax 97 Black, Alexander Wang x Adidas AW run, Personally Customized Ultraboost V1. Finally, what does Katha mean? Where did you get the inspiration for the name? The Filipino meaning of “katha” translates to English as a creation of the mind, or an idea. The word stuck with us because we had a lot of ideas in the pipeline for future releases that will be really unique. This is also why we make it a point to name each colorway—it's supposed to evoke an image in your brain, they're not just designs. We also realized that the word had other meanings in Sanskrit—it can mean a legend with religious connotations, kind of a mix between story and prayer, and it also literally means distress. These definitions also resonated with us since we view the act of engaging in streetwear culture as telling your own story to the world. [Distress because] trends come and go but brands always try to shock their audience and deliver something new. Streetwear is also a kind of religion in itself. The ambiguity is something that really drew us in. We've set our goals as high as being a global brand and we want people to talk about what it means and discover these different meanings. We liked that it could have that amorphous quality that would make people argue about how the name is pronounced and what it really means.